This many wax scales make up an un-jolly holly. The holly and the wax scale - Ceroplastes sp. At this time of year Bug of the Week often visits a holly tree to see what surprise it has in store. Holly trees play a significant role in the beliefs and traditions in this festive season. To the Romans, hollies were the trees of the god Saturn and wreaths of holly were gifts during his holiday, Saturnalia. In Celtic legends, the evergreen hollies with their beautiful red berries, announced the ascension of the Holly King during the winter season over the Oak King who ruled the forest with his green leaves in the summer. For Christians, the pointed leaves of the holly are associated with the crown of thorns worn by Jesus and the bright red holly berries symbolize drops of his blood. Beneath the white wax is the small reddish scale insect. For a bug geek, what could be more exciting than a holly branch festooned with white waxy insects and leaves sticky with honeydew and dappled with sooty mold? The remarkable insects that often make their presence known on hollies are wax scales. 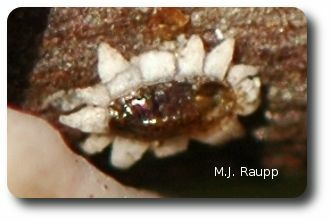 Wax scales are regular perennial pests of many trees and shrubs found in southern states where temperate climes suite their life style. In recent years with warmer winters further north, we have seen many southern pests creep into higher latitudes. Although it is not unusual to find wax scales as occasional visitors in Maryland’s landscapes, to see a holly so heavily infested is truly a marvel to behold! For obvious reasons young scales are called cameos. The large wax scales on the holly are adult scales that will endure the chilly winter on the bark of the tree. In spring these largely sessile creatures will resume feeding and begin to lay as many as a thousand eggs in the late spring. In the wild, males of this species have not been observed. The females have found a way to bypass the romance and get straight to the business of laying eggs. This interesting reproductive strategy called parthenogenesis is fairly common in insects. Eggs hatch and tiny mobile crawlers move along branches and find new places to hunker down, insert their long sucking mouthparts into the bark of the tree, and imbibe nutritious sap. They soon produce a small ring of wax around their bodies. Their resemblance to Victorian bling, has earned them the name cameos. To acquire sufficient nutrients from the sap requires a great deal of sucking and excess food is eliminated in the form of sweet, sticky, liquid called honeydew. Sooty mold is a sure sign of a honeydew producer. We met other honeydew producers like aphids and tuliptree scales in previous episodes of Bug of the Week. The honeydew accumulates on bark and leaves and serves as a substrate for the growth of fungus called sooty mold. Sooty mold does not harm the holly directly, that is, it causes no disease. However, some people find the grimy substance disagreeable and one can imagine that enough sooty mold might cut down on the plants ability to gather energy from sunlight. For bug geeks, sooty mold is a sure sign of the presence of a potentially glorious insect and a signal to intensify the search. When abundant, wax scales can really set your holly back. If you find wax scales on your hollies, and deem them problematic, one easy solution is to simply pluck them off the plant and toss them to the ground. On the soil they will be consumed by a ravenous horde of ground dwelling meat-eaters. Destruction of wax scales is easily accomplished during the holiday season when adults are large and apparent. In spring after thousands of eggs hatch, the task of destroying scales is more complicated. So, as you deck your halls with boughs of holly, remember ‘tis the season to pick wax scales, fa la la la la, la la la la. We thank Tina, JD, and Paula for inspiring this episode of Bug of the Week. To learn more about wax scales please visit the following web site.